Mike's source PDF on Github. Mike's Github home for this work. GRC's archive of Mike's PDF for safe keeping. The “Assistive Technologies” backdoor into free Windows 10 Upgrade. PiVPN, incredibly simple-to-setup OpenVPN for Raspberry PI. The Windows Update Update Update. (This link is here for historical purposes. The link above provides a definitive guide.) This is required to get a new installation of a previous version of Windows to recognize today's Windows Update because Windows Update was changed in a non-backward compatible fashion after those earlier Windows installation images were built. 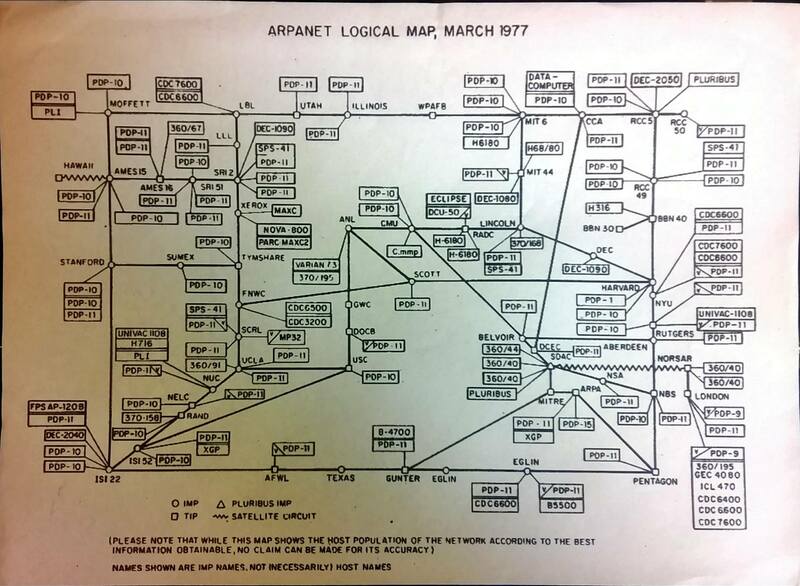 The ENTIRE Internet as it existed in 1973. 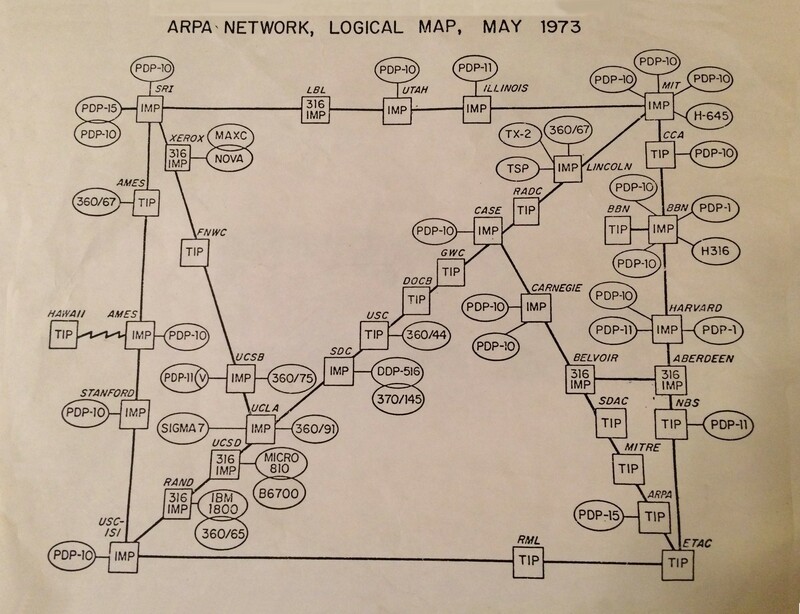 The ENTIRE Internet as it existed in 1977. This incredibly clear explanation of cryptographic operations was written by Princeton University's Edward Felten. As Ed explains it: “This paper offers a straightforward introduction to encryption, as it is implemented in modern systems, at a level of detail suitable for policy discussions. No prior background on encryption or data security is assumed.” It is widely regarded as the clearest and cleanest explanation of crypto operations ever written. A surprisingly accessible 580 page tour de force being written by to crypto/security professors: Dan Boneh, Professor of Computer Science and Electrical Engineering and Co-director of the Stanford Computer Security Lab, Stanford University and Victor Shoup of New York University. This is an wonderful introductory course on cryptography in a 252-page PDF. It is freely available for programmers of all ages and skill levels. The Forward of the book describes itself as: ...an introduction to cryptography for programmers of any skill level. It’s a continuation of a talk of the same name, which was given by the author at PyCon 2013. The structure of this book is very similar: it starts with very simple primitives, and gradually introduces new ones, demonstrating why they’re necessary. Eventually, all of this is put together into complete, practical cryptosystems, such as TLS, GPG and OTR. The goal of this book is not to make anyone a cryptographer or a security researcher. The goal of this book is to understand how complete cryptosystems work from a bird’s eye view, and how to apply them in real software. Coursera offers a number of free online courses in cryptography and cybersecurity. SN #570 | YouTube video (2:07): Grace Hopper shows us a “nanosecond” and a “microsecond”. .WWWW.• An excellent USB explainer, including Type-C and USB 3.x 1st & 2nd gens. SN #575 | Willie Howe's “Technology: Simplified” YouTube channel dedicated to Ubiquity router how-to configurations.